In a year full of fresh releases which more than held their own against the usual onslaught of recycled Golden Oldens (most notably the Ramones mini-box, the Shaggs' still-futuristic "Philosophy Of The World," the equally incandescent Raymond Scott and Elvis "Sunrise" collections, The Boys Next Door's criminally-overdue eponymous retrospective and, speaking of which, Sea Of Tunes' hundreds upon hundreds of hours' worth of 1960's Beach Boy out-takes), 1999 still managed to deliver several dozen true, NEW Works of Wonder into my mailbox. Reviewing the round-up below, I'm tempted to psycho-analyze this Top Ten as displaying an actual sum-up-in-miniature of the entire 20th Century of Sound, stylistically speaking that is (sweet singers, a bit of country, lotsa good old-fashioned Pop). But that wagered, insofar at least THIS Pig's concerned the governing factor's forever been, roughly, If it's got a nice tune, and if it can move me even first thing in the morning, then it'll ALWAYS make my grade. Nothing more, Nothing less. And I bet those in the sonic know were thinking pretty much the same thing as the 19th Century closed down too. 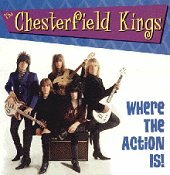 Chesterfield Kings - Where The Action Is! (Sundazed). Wherein the Upstate New Yorkin' Glimmer Brothers Five bring it all straight back home via the legacies of the Standells, Hollies, Syndicate of Sound, Dave "Death Of A Clown" Davies, with even a more than able big assist from the Voice of the Raiders Himself, ladies and gentlemen, Mark "Madman Marcus" Lindsay. "Where The Action" was, without a doubt, the most FUN release of 99. Yes, FUN. Remember FUN?!! Cloud Eleven - Cloud Eleven (Del-Fi). Power Pop's been spending the past quarter-century dismantling, studying, grappling with and ultimately rebuilding that great big, daunting-yet-then-some Lennon / McCartney song folio. Rick Gallego, d.b.a. 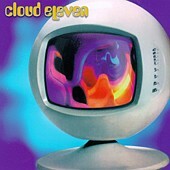 Cloud Eleven, herein does much, much more than his fair share to Beatle (et al) his way well towards Y2K and, ultimately, far far beyond with his dayglo voice, his turn of a phrase, and even a Lovin' Spoonful tune thrown in for full measure. Magic, I do believe. 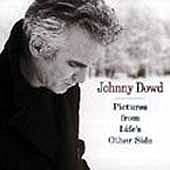 Johnny Dowd - Pictures From Life's Other Side (Koch). Deep, dark, disturbing and cunning AND "funny" as all get-out! Yessir, like big bad America itself, Johnny Dowd sweeps thoughtfully from coast to coast, up-ends all that gets in his way, then shoves proudly forward with -- if we're lucky -- simply a friendly, heartfelt smirk into the rear-view to letcha know he most definitively Saw before he Went. Monumental but only in all the most humbling, down-to-earth of ways. 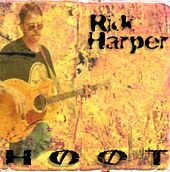 Rick Harper - Hoot (HiVariety). Who knows how many frightfully prolific writer/composer/recorders the caliber of Rick there are, busy waxing as insightfully philosophic in kitchens and basements across our globe? While we all ponder not only this, but why we aren't hearing MORE of them more often on, for example, our Radios, let's all take a close listen or twelve to this wonderful, wonderful collection of trials 'n' tunes, created as only this single man seems to be completely capable of anymore. Really. 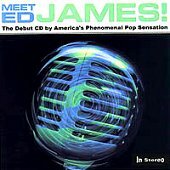 Ed James - Meet Ed James! (JAM). "Just a guy on a mission to write the perfect song," claim the liner notes enclosing these 13 rare delights. Well, as I bet Ed himself would be the first to admit, there really IS no such thing as the perfect ANYTHING, now is there? (I ask, while deflecting my gaze again from that Ramone retrospective). Even so, never before has one quest for that all-elusive Something Flawless sounded quite as mesmerizing, captivating, and downright Danceable! I, for one, certainly hope Ed turns out another nine or ten albums BEFORE he writes The Perfect Song. 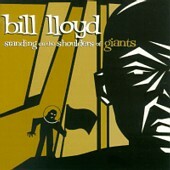 Bill Lloyd - Standing On The Shoulders Of Giants (Koch). Ever since his trend-bashing days alongside that Foster feller, Bill has been brazenly raising his Wall of Guitars against all out there who may sometimes APPEAR fiery, but in truth are simply so much melodic smoke. Sure, the man knows how to doll out the Ear Candy at the mere drop of a chorus, but "Standing On The Shoulders Of Giants" slyly makes a four-to-the-bar MISSION out of its wickedly spinful regurgitation of all things POP. Not to fear, though: As ever, Bill Lloyd keeps at least one foot solidly planted atop the Here and the Now rather than lingering too long upon the laurels of Giants past, and in doing so goes long ways in separating the Hash from that same old Rehash. James Richard Oliver - The Mud, The Blood And The Beer (Illbilly Records - PO Box 924, Blue Ridge, Georgia 30513-0924). As if an unwitting tribute to the late, very-great-indeed Shel Silverstein, the one-and-only Tele-flailing Terror of the Georgian out-back unleashes herein his first full-length, non-cassette release. And only a man as razor-sharply cut as J. R. Oliver could have made one single digi-disc hurl and spit with all the verve and wit of some long-forgotten Waylon Jennings slab-o-vinyl. (yeah, analog may have been warmer, but JRO's HOTTER). "Alternative Country," you might then ask? Naw this is more like Alternative MUSIC. There's a cool little map inside this cool little disc, which points out all the finest in hum-worthy rest-stops between Mocksville clear on over to Harmony and beyond. 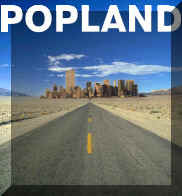 And like its delightful packaging, Popland have delivered a musical journey that covers tons of ground, but never once sticks to the same (middle of the) road, less its impact and interest overstay its very welcome. Bonus Points Awarded for the damnable-and-then-some title of the opening track, "Never Liked The Beatles." Yeah, and You Neither! 9. Various Artists - Hit The Hay, Volume 3 (Sound Asleep). Where oh Where would we be, were it not for Jerker Emanuelson's little-label-that-could, and back-to-back winners like those which pack this latest compilation of his from Sound Asleep of Sweden? Probably still pondering the fate of Chris Gaines and other such pretenders towards their throne, I think I digress. Anyways, the fabled "Hit The Hay" series herein boldly continues to expose to the world just the very, very best in all things American Music. Hmmmm. Too bad an AMERICAN label isn't busy doing the same thing, of course, but then you'd better not get me started on THAT one. 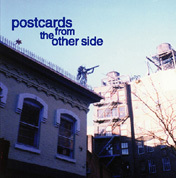 Various Artists - Postcards from the Other Side (Lazy Cat). Like the afore-mentioned Swedish holiday, Maki Kobayashi and her Lazy Cat have compiled THEIR second overview of only the choicest in American rock, pop, and rooty rock-pop (such as John Wesley Harding! Randell Kirsch! Chris von Sneidern! Mark Johnson!) From the exquisite packaging clear on down to the not-even-in-English liner notes for a change, this Japanese collection is a definite Must Hear for any of us residing in EITHER Century! Too bad an AMERICAN label isn't busy doing the... oh, never mind.